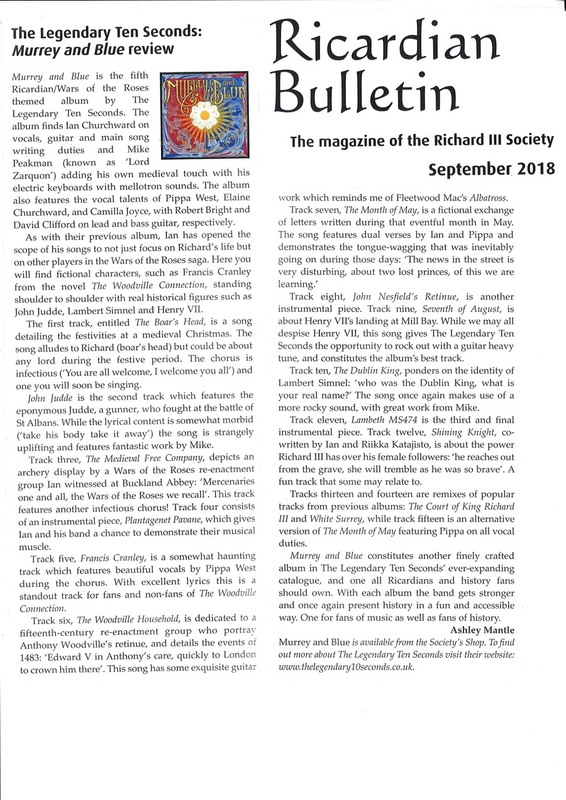 Murray and Blue is a concept album of songs by The Legendary Ten Seconds about the Wars of the Roses and England in the late fifteenth century. John Judde, who died at a battle at St Albans, another song inspired from Toni Mount's book about life in medieval London. John Nesfield's Retinue, this instrumental is for the retinue of John Nesfield. Sir Ian Churchward vocals, guitars and mandola. The Lord Zarquon keyboards, bass and drums. Earl David Clifford bass guitar on John Jude, The Medieval Free Company, Court of King Richard III and White Surrey August 1485. Earl Robert of The Shroud guitar on John Judde, John Nesfield's Retinue and The Seventh of August. Lady Pippa West vocals on The Boars Head, The Medieval Free Company, Francis Cranley and The Month of May. Lady Elaine Churchward vocals on The Seventh of August. Lady Camilla Joyce vocals on the 2017 versions of Court of King Richard III and White Surrey. Sir John Bessant lap steel guitar on The Dublin King and Lambeth MS 474. All songs written by Sir Ian Churchward except Shining Knight written by Lady Riikka Katajisto and Ian Churchward. All songs arranged by The Lord Zarquon.